In order to manage my stress levels, the task of opening the suitcase which came with the memorial cup was postponed even later than planned. I had intended to open it once Exeter Quilters’ exhibition was out of the way in mid August BUT was somewhat deflected by the need to spend the following 6 weeks on my contribution to the Chinese Whispers project being organised by Ellen Seward for the Loch Lomond Show 2014 ( Shh…… more about this later next year). Once my entry was finished and dispatched to the next person in the chain, I spent a morning with friends, Beryl White from Paignton and past winner of the award, Jeanne Stetson, and together we had a grand unveiling. Knowing that I had to make a contribution it was scary but once the contents were displayed, it was not so bad as I feared. Several winners had been able to put in one or more of their published books: e.g. Barbara Chainey (the first winner in 1999) put in her book entitled “The Essential Quilter”. Jenni Dobson (2003) with her “Patchwork and Applique”. Christine Porter (2010) with her 2 books, one on Floor Tiles and “Viva Venezia”. 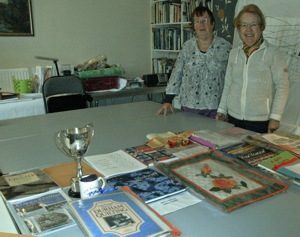 Jenny Rundle and Sharon Garrick (2012) who organized the quilts and pennants for the teams in the 2012 Olympics and Paralympics, submitted a copy of their book “A Gift of Quilts” plus items to show how icons were used in the logo . Jackie Taylor (2011) from a second shop in Wolverhampton put in a copy of her review in P and Q along with the first of the sewn items, a small quilt depicting a feathered Star. Having no published books or articles, I too will go down the road of submitting a small wall-hanging featuring a hand appliqued, stylized house from Pat Cox’s “Fraktur“ pattern set. This is where my heart is and the association with committee meetings for region 4 QGBI, Exeter Quilters’ house meetings, monthly meeting of “The Perfect Circles”; the annual picnic in my garden hosted since 1985 and almost 20 years of hosting Pat and her loyal students every summer in their quest to perfect their applique. Lastly we were pleasantly surprised to find a copy of Amy Emms’ M.B.E. book on quilting in the suitcase along with a copy of the article about her in P and Q 1992. This featured the photograph of my daughter Ruth being presented with her award as a Young Quilter by Amy herself (which featured on the back of the last issue of SWQ magazine). Funny how some things go in a circle! I remain humbled but proud at receiving the award for the last time especially with the eminent names listed above and look forward to completing my chosen item.